Your wedding bouquet is one of the most personal expressions you can make on your wedding day. A chance to choose flowers that mean something to you, or have special memories that you can easily incorporate into your theme. 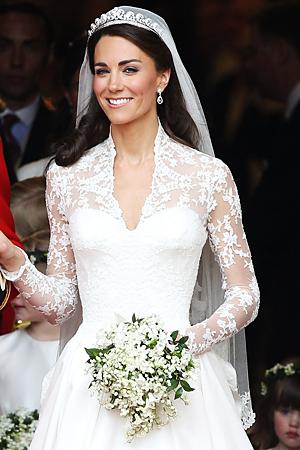 When Kate Middleton married Prince William on the 29th April 2011 at Westminster Abbey she chose a very understated and simple bouquet – especially when compared to the excesses of Princess Diana’s huge statement bouquet of the 1980’s. Katherine chose to keep the colour palette all white but she chose the blooms that she carried very carefully. Each flower was hand picked for a very specific reason, and each bloom was also chosen as it would be naturally in season at this time. The bouquet was mainly made up of this sweet, gentle bloom and represents Trustworthiness (a most apt flower to include on your wedding day) Humility, the return of happiness, purity of the heart and is the symbol of loves good fortune. 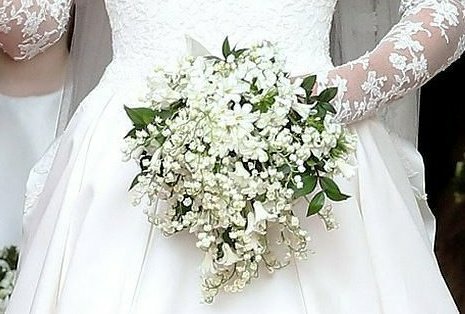 It is a Royal Tradition to include a sprig of Myrtle in the wedding bouquet. The tradition started with Queen Victoria and has been continued in every royal Brides bouquet ever since. The Myrtle used in Katherine’s bouquet was actually grown in Queen Victoria’s private 175 year old garden at Osborne House in the Isle of Wight. Myrtles special symbol is Love and is the Hebrew emblem for Marriage – how apt. We like to think that this was chosen to be included because it is the name of her Prince, but Sweet William also represents Gallantry and the promise of a smile. Very romantic. Ivy is one of the most popular blooms to be found in a bouquet and it is not hard to see why. Ivy symbolises Marriage, Affection, Fidelity and Friendship. The Hyacinth has a double meaning. It symbolises Sport (both Kate and William are sporty) but it also represents Loveliness and the constancy and continuation of Love. The flowers carried by the flower girls and worn in their hair also replicated Katherine’s bouquet, consisting of Lily of the Valley, Sweet William and Hyacinth.